While I'm originally from the Scottish Borders, and it was a nice place to grow up, Edinburgh quickly became my second home when I went there for university. I may have left it to jet off halfway around the world to Hong Kong, but I would happily live there again one day. There's so much history and culture happening in the city, and I think it's beautiful with the old buildings and cobbled streets (really not a fan of modern architecture over here!) - though I weirdly don't have as many photos of the city as I thought! SO here's my little alphabet guide to the city, covering place, people, and events. Towering over the city centre, lies the remnants of an extinct volcano, known as Arthur's Seat. It's a popular hike for locals and tourist alike, being so centrally located, a fairly easy climb, and offering panoramic views around the city. I've been up it many times myself, the first time being during my first year at university, when was living in Pollock Halls, located at the base. There's a few different routes you can take, ranging in difficulty, and the rocky peak can be a little challenging, but it's worth it for those views. How many cities can boast a castle seated atop an extinct volcano right in the middle of the city? Not many I'd imagine. Edinburgh Castle is beautiful and iconic, with panoramic views of the city from the castle itself, and a splendid view looking up at the castle from Princes Street. The superstition goes that if students enter while still studying, they will fail their degree, but I went a handful of times with summer school students and passed mine just fine! I wouldn't say it's all that exciting inside, apart from the Crown Jewels, but it's certainly one of the most popular tourist sights. The Edinburgh Dungeons is one of my favourite tourist attractions in the city, since it's so fun and interactive. For those unfamiliar, you take a journey underground, encountering historical and/or mythical figures who tell you their disgusting, horrifying stories, ranging from torture, cannibalism, the plague, and murder. There's loads of interaction and scary goings-on around you. I went a lot with my summer school students, and spent most of the time laughing at how scared they all got. I do know it inside out by now, so it's not quite as fun as it used to be, but still worth a visit for those who haven't been. This little cafe, located on George IV Bridge in the Old Town, would be just another quaint, cosy little cafe in the city. If it weren't for the fact that it is known locally as "The Birthplace of Harry Potter", as it was one of J.K. Rowling's favourite places to come to write. Now, it's usually rammed with fans of the series, and while most of the cafe has retained its normal, cosy decor, with plenty of elephants around, the bathrooms are worth a visit to see the hundreds of scrawlings dedicated to Harry Potter all over the walls, from quotes to memories to thank yous. The largest performing arts festival in the world, the Fringe has over 50, 000 performances of over 3, 000 shows, taking place over 3-4 weeks in August every year. The city is buzzing for the whole month, as it swells with performers and tourist alike, and there's this incredibly, fun, electric atmosphere everywhere. 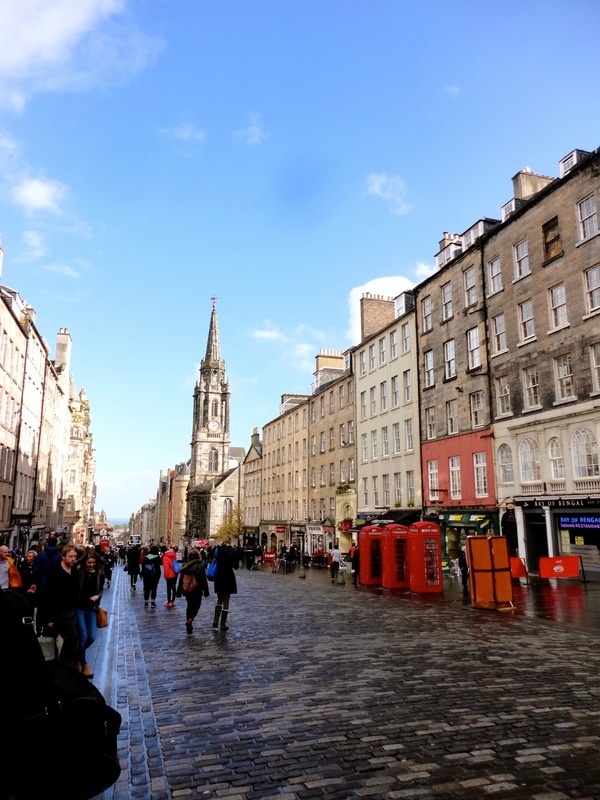 There's something for everyone, from theatre to dance to music to comedy, the latter being probably the biggest genre around, and the Royal Mile is the heart of it all, closed to traffic all month, with street buskers and performers flyering for their shows. It can get a little tiring, and by the end of it most of the locals are ready for it to be over - but that never stops us getting excited for it as it approaches each year! Another of Edinburgh's quirky historic stories. Bobby was a Skye terrier dog, who supposedly belonged to a local policeman, John Gray. He was such a devoted pet, that when his master died, Bobby would spend his days lying on the grave, in Greyfriars Kirkyard, only leaving to get lunch from a nearby cafe when the One O'Clock Gun went off. Bobby kept guard for 14 years, until his own death, and was then interred in the same graveyard. A statue of the little dog is just outside the graveyard now, opposite the pub named after him. If any place in the world knows how to party on New Year's Eve, it's Edinburgh. Sure, there are plenty of other cities that have big celebrations for it - but how many of them shut off the whole city centre for a 100,000 person street party? Hogmanay is the Scots term for New Year's Eve, which is celebrated across the country, but Edinburgh's is the biggest organised event, spanning the length of Princes Street and several side streets, and hosting numerous bands and performers across 5 or 6 stages. Fireworks are set off from the castle every hour from 9pm, until the main display at midnight, and the whole thing is broadcast across Scotland. It's a truly massive party, worth doing at least once - when my sister and I went last year, we were front row for Twin Atlantic! Ok, this one isn't restricted to Edinburgh, but this is such a quintessentially Scottish thing, that I felt I had to include it on the list. Irn Bru (pronounced "Iron Brew") is a fizzy drink, whose flavour I can only describe as sugary and carbonated, and it's bright, bright orange in colour. Doesn't sound particularly appetising (and honestly, it's not something I drink that often), but I've introduced many people to it who've ended up loving it, and many a Scot will swear by it as a hangover cure. Edinburgh is full of Harry Potter connections, like the Elephant House, which is hardly surprising when the author hails from the city herself. Edinburgh has been home to many famous and notable people over the centuries, but Rowling is probably one of the most recognisable names these days. She graduated from university there, and still lives in the city. Other notable Potter sights include the room in the Balmoral Hotel where she completed the entire series, and the gravestone of Thomas Riddell in Greyfriars Kirkyard, widely thought to be the inspiration for Tom Riddle. Kirk is the Scots word for church, and there are hundreds of them all across the country. Some of the notable ones in Edinburgh include; Canongate Kirk, whose parish includes Holyrood Palace and Edinburgh Castle, and was also the location of Zara Phillips' wedding in 2011; Tron Kirk, which is closed as a church, but is a landmark sight on the Mile, and now functions as an information centre and small marketplace, typically known as just "The Tron"; and Tolbooth Kirk, situated at the top of the Mile, whose gothic spire is the highest point in central Edinburgh, and which is also no longer a church, but now is "The Hub", the home of the International Festival. Edinburgh is the UK's only UNESCO City of Literature, and this is a subject particularly close to my heart, as my degree from Edinburgh University is in Literature. The city hosts its International Book Festival every year, and the university has plenty of talks and such from authors. Famous authors from Edinburgh include J.K. Rowling (of course), J.M. Barrie, Robert Louis Stevenson, Arthur Conan Doyle, Muriel Spark, Irvine Welsh, Ian Rankin, and many, many more. The home of Scottish rugby, Murrayfield is the city's stadium, and the largest in Scotland. Located in the west end, and with a capacity of over 67,000, the stadium is primarily used for rugby matches, most notably the Autumn International Tests, and Scotland's home games during the Six Nations. It has also been used for other sports, including rugby league, football, and American football, as well as for music concerts, hosting the likes of The Rolling Stones, Oasis, Madonna, and most recently, The Foo Fighters. While many will argue that Glasgow's scene is better, there's certainly no shortage of nightlife in Edinburgh, and I saw my fair share of it during my four years as a student there. Different areas have their own atmosphere; George Street is more upmarket, with fancier bars and steeper prices, while Cowgate is home to the dark, dingy, cheap clubs - I could typically be found in the latter... There's also a pub on just about every street, and - joy of joys - drinking in the street is legal in Edinburgh! For most of the year pubs close at 1am and clubs at 3am (which now seems so early to be after living in Hong Kong), but during the Fringe most places stay open later, with many clubs seeing in the dawn at 5am. The historic heart of Edinburgh, the Old Town started with the Royal Mile (see below) and sprawled outwards, with tall, narrow "closes" (often little more than alleyways) lining it on either side. Most of the Old Town dates back to medieval times, and it is now part of a UNESCO World Heritage Site to preserve the layout, buildings, and iconic cobbled streets. 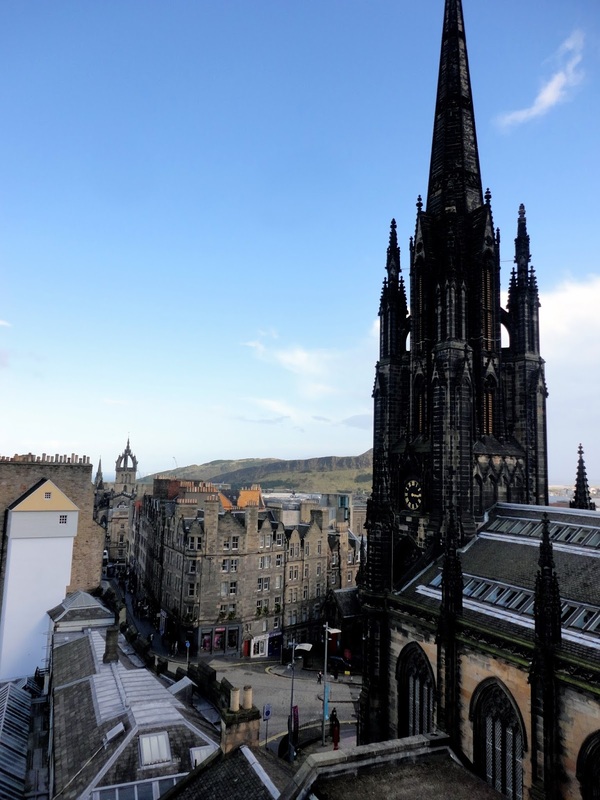 As well as these beautufl historic buildings, and landmarks such as Edinburgh Castle and Holyrood Palace, which can be found in this area, there is a whole other world below the city, where a network of underground catacombs and tunnels exists. The Old Town used to have very "high rise" buildings, as people wanted to live packed in around the city's defensive walls, but the lower portions have now been covered and built over, in part due to the Great Fire and the plague. Princes Street is the beginning of Edinburgh's New Town, the area to the north of the Old Town, once separated by the Nor Loch, which was drained to become Princes Street Gardens, and for the New Town to be constructed in the 18th century. The New Town is more spaced out and classically designed than the old. Much of it is residential flats, but Princes Street is the shopping centre of the city, a long street lined with all the big UK brand names. This is also the street that is closed for the Hogmanay party, and from here you find the perfect view looking up at the Castle, since the buildings only line one side of the street. Nothing is allowed to be built on the other side, in order to preserve this view. Or more specifically, South Queensferry (North lies across the Firth of Forth) is a town on the west side of Edinburgh, on the shores of the Firth of Forth, the inlet separating Edinburgh from Fife. From the town, you can look out and see the Forth Road and Railway Bridges spanning the water, and the newest addition, the Queensferry Crossing bridge. The town has various local traditions, such as the Ferry Fair and the Burry Man, but the most well-known and popular is the Loony Dook. This takes place on New Year's Day, and is allegedly a great hangover cure for your Hogmanay revelries, as you get decked out in the most ridiculous fancy dress outfit you can, and plunge straight into the freezing cold waters of the Firth - loony indeed! It's been mentioned a few times already here, but the Royal Mile is truly the heart of Edinburgh, the street where it all began. It stretches down the ridge of the old volcanic formation, from Edinburgh Castle at the top, to Holyrood Palace at the bottom, these two residences giving the street the "Royal" part of its name. It's not a true mile long though, but is actually a Scots mile, which is a little bit longer. The street is actually divided into 5 streets, with their own names. The High Street, in the middle, is often the busiest, home to sights such as St Giles' Cathedral and the Heart of Midlothian, and it is here that much of the Fringe festivities take place. The Mile connects to Princes Street by the Mound, or by the Bridges, with Princes Street Gardens separating the Old and New Towns. The tallest monument to a writer in the world, this 200 foot tall Victorian Gothic tower stands right in the middle of Princes Street, easy to spot from many parts of the city. Sir Walter Scott was a writer in Edinburgh in the early 19th century, penning many well-known novels. One of them, Waverley, gave its name to Edinburgh's main train station, just a few minutes away from the monument. The monument has various viewing platforms, accessible by a narrow spiral stair, for views all around the city centre. It's certainly another of Edinburgh's iconic pieces of architecture. Whether you've read the book, or seen the film (though please be aware that large chunks of that were filmed in Glasgow! ), Trainspotting is a cult sensation, and is intrinsically linked to the city. Centred around a group of heroin junkies from Leith, and set in the 1980s, the story features many Edinburgh locations, and is entirely written in the Scots dialect (which takes a while to get used to reading, even as a Scot myself, since we speak it far more than we read or write in it). While it's a story that only shows one small side of life in Edinburgh - the majority of us are not heroin addicts - it's certainly a book worth reading if you're familiar with or even just visiting the city. The University of Edinburgh is a crucial part of the city as a whole. Hundreds of buildings in the Old Town are owned by the Unversity, sercving various functions, with George Square being the central campus, and the home of most humanities degrees. Several of the most impressive buildings can be found here, including Teviot Row House, a gothic building reminiscent of Hogwarts, and the oldest student union in the world; McEwan Hall, the location of graduation ceremonies; and Old College, whose dome roof and grassy quad make it the quintessential old British university building. The university is also a huge part of the city's history, as it was established in 1582, the sixth oldest in the UK, and played a massive part in the Scottish Enlightenment, a period of great intellectual advancement in the 18th century, by producing many notable graduates. It still does well in most of the world ranking systems, typically landing in the top 20, and entry is highly competitive. While there were many things about it that irritated me during my studies, I am quite proud to have a degree from it now. Vikings? This is Scotland, not Scandinavia! Very true, but way, way back in medieval times, from roughly the 8th to 15th centuries, there was a large Viking presence in Scotland, which naturally played a part in shaping the country's history and culture. I'm not enough of a history buff to tell you much about the Viking invasions, but I don't think they really got as far as Edinburgh, however their presence can still be felt in the city. One of the traditions taking place during Hogmanay is the Torchlight Procession, in which thousands of people march, with their massive flaming torches, from the Mound, along Princes Street, and up Calton Hill, on 30th December, and it is led by a few dozen Up Helly Aa Vikings, hailing from the Shetland Islands, which do have old Norse connections and ancestry. Ok, I'm cheating with my alphabet a little bit here. Anyway, Christmas time in Edinburgh is simply beautiful. The whole of Princes Street Gardens is transformed into the Winter Wonderland and German Market, with cosy wooden stalls selling all sorts of gifts and crafts, as well as lots of delicious food, from German sausages and pretzels, to sweet crepes and chocolates, to warm mugs of mulled wine or hot chocolate. There are also lots of fairground rides and games in the same area, with the ferris wheel at the centre of it all, and there's usually an ice rink, which recently moved from the Gardens to St Andrew's Square, just a few minutes away. All of this is in place for several weeks in December, until just after the New Year. Not just any yacht of course - the harbour at Leith is home to the Royal Yacht Britannia, which used to belong to the Queen. It was in use for over 40 years, taking the Royal family all over the world, covering over a million nautical miles, before it was eventually retired in 1997. The Queen loved the yacht, and reportedly shed a tear at the decommissioning ceremony. Edinburgh won the bid to home the yacht, and it is now a tourist attraction, with an audio tour of the whole thing. I actually used to work onboard, as a waitress in the Tea Room, and we also catered private events on board too. And finally, to round off our alphabet, there is Edinburgh Zoo. I know zoos can be controversial, and I would much prefer to see animals running wild than in captivity, but I do feel that much of Edinburgh Zoo is well designed, in an attempt to give them sufficient space, and it is a charitable organisation, which is involved in conservation projects around the world and breeds endangered species. I saw some of this firsthand, while doing a school Biology project on-sight, observing lemur behavioural patterns. It's also the only zoo in the UK to house giant pandas and koalas, and the daily Penguin Parade is highly popular, where the animals have the option to leave the enclosure to mingle with the guests (but are by no means forced to). And that brings us to the end of the alphabet! Hopefully that gives people a taste of what Edinburgh has to offer. Would anyone choose anything else for any of the letters?